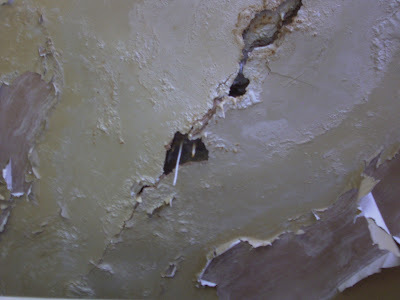 Here are a couple of photographs of the ceiling in my back office at work. We had a leak a number of years ago (yes years!) which has never been fixed properly and now you can see the result. 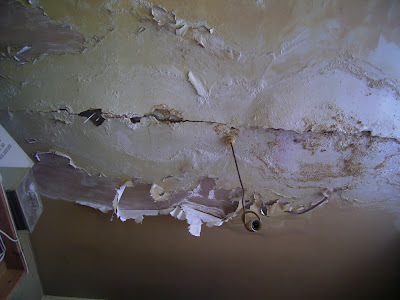 The water slowly drips through the ceiling causing icicles composed of i know not what. The paint is peeling as the problem spreads with dust falling from time to time. I wander what exactly the dust is composed of and what i'm breathing in. Not to mention the damp. Should i have to put up with this? My boss (who works at another office) is aware of the problem and has had a couple of roofers try to fix the leak without success. The last try was several months ago. Since then he seems reluctant to try again because of the cost. Should i have to put up with this? What should or can i do?